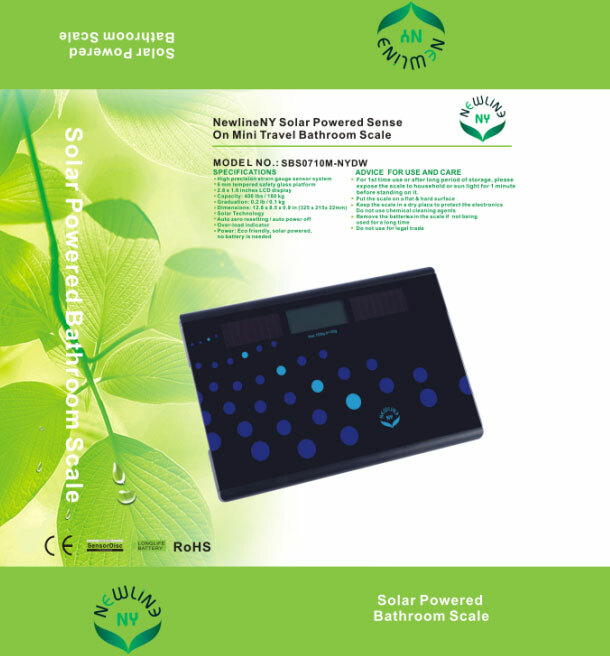 This is NewlineNY USA’s newly innovated Eco-friendly Solar Digital Mini Travel Bathroom Scale, SBS-0710M-NYDW. This “Go-Green” scale has 2-sets of built-in solar cells that can largely draw power from sunlight or ordinary household lights. The solar scale not only eliminates the need to buy or recharge batteries, but also saves our landfills from battery contamination. It's made of glass (attractive, durable, and no chemical exposure from plastic). The NewlineNY Solar Mini Bathroom Scale also featuring light weight & cool look. It is portable to monitor your scale when traveling or anywhere you go. The scale is small, but would not reduce the weighing function and accuracy. It's not only perfect for toddler, but excellent for teens or adults. This scale also comes with the latest "Auto-Step-On" technology. There is no need to tap, simply step on the scale to get a reading with 5 seconds automatic shut-off to preserve battery. The scale features a wide platform and a large LCD display. The Newline NY Ultra Slim Scale is great for travelers, and will be a great addition to fit in any home or bathroom décor. Tips: Always expose the scale to solar or ambient lights for 1 minute for the 1st time usage or from no light storage.